On one of my most recent photos on Instagram I asked you as an audience what you would like to see more of from Shirtstuckedin. A large majority of you asked for more photos and detailed blog posts so let this be a start of many years of photos to catch up on. Just over 2 months ago I set off for Japan for a short 10 day trip to pickup my new car and attend a few events such as the annual Kansai All Stars GP in Meihan Sports Land. Returning over 7 weeks later, here is a little scratch of the surface as what unfolded. 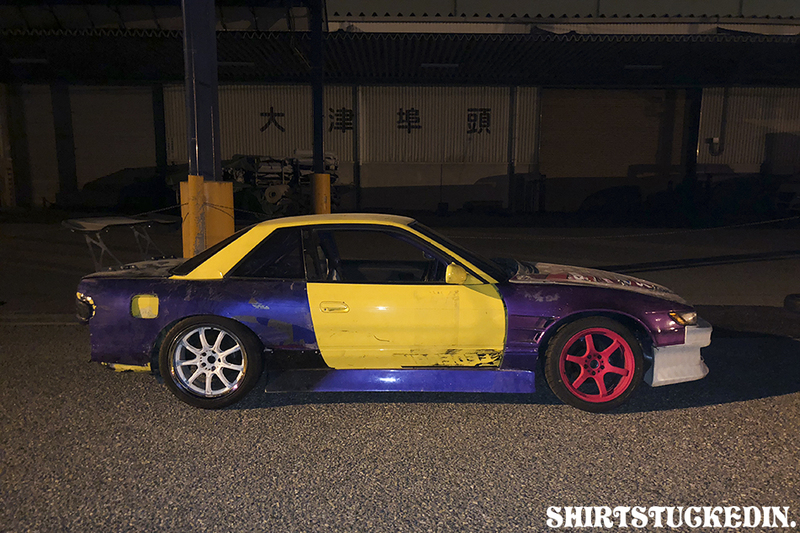 My previous purple S13 was sold in order to get into something a little more setup and not so cosmetically sound to ensure confident driving which was replaced by this yellow S13 that I purchased off Naoki Nakamura. 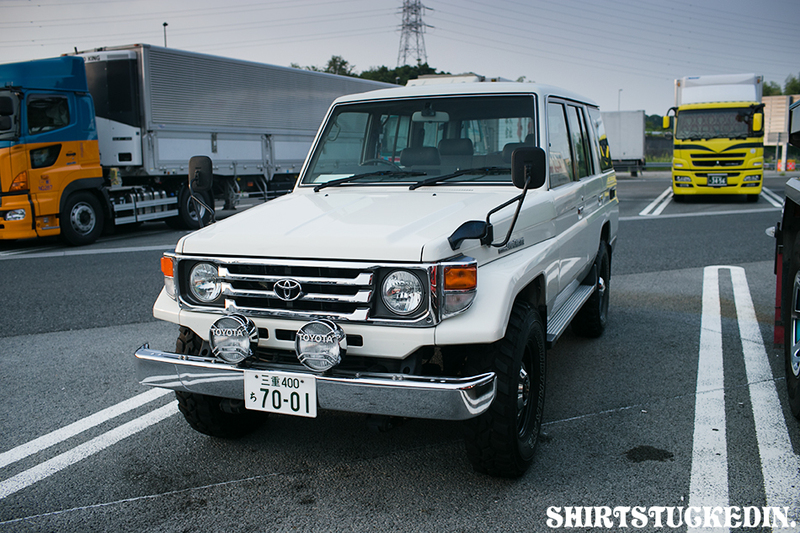 Driving this back to Osaka from Nara was interesting. The first day I was there I began fixing and replacing a few things and getting it somewhat ready to drive with the help from the boys at Stacked. Shane, Jamie, Naoki, Ryota all donated a bunch of left-over aero from previous cars that were no longer running which made the car look a little neater. I bought this car purely for the reason that most of the engine and driveline were mechanically A+. Time is always limited in Japan which lead me to such. 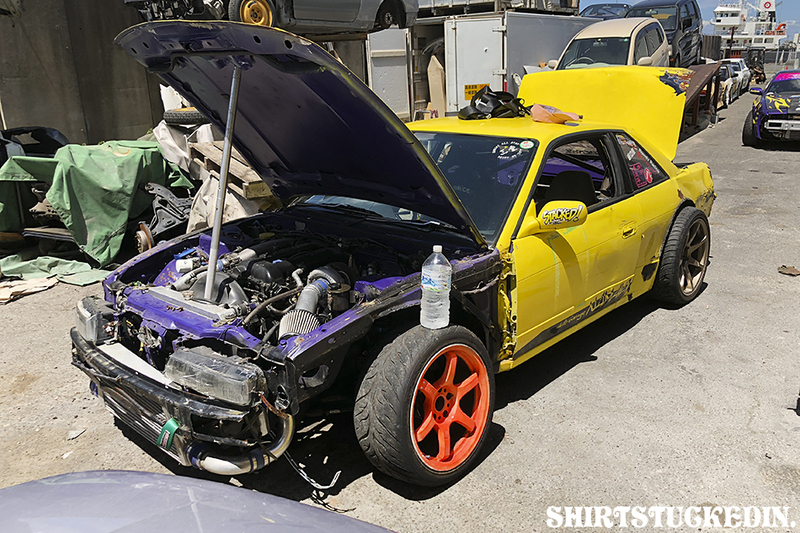 The engine is a rebuilt S14 SR20DET with a metal headgasket, step 1 cams, HKS GT3037 with a high mount TRUST manifold, intercooler, oil cooler, radiator, RB25 fan, 2 way, b-knuckle and that is pretty much it. I have driven a few previously owned turbo cars but never enough to get into the groove so this was all still relatively new. From my trip last year with the beige car I ran TOYO R1Rs up front which definitely was the pick for this car. 235/40/R17 on a 9J +12 Rays 57D. Including all the aero off Naoki he also granted me with his X-D1 Origin Labo bonnet off his old S13 which quickly founds its place on the S13. Here it is the night before somewhat looking like a car. Alongside my new purchase Keisuke Nagashima from New Zealand purchased another car off Naoki Nakamura with all means and hope to start driving with friends and relations we have met over the past decade from traveling and shooting in Japan. 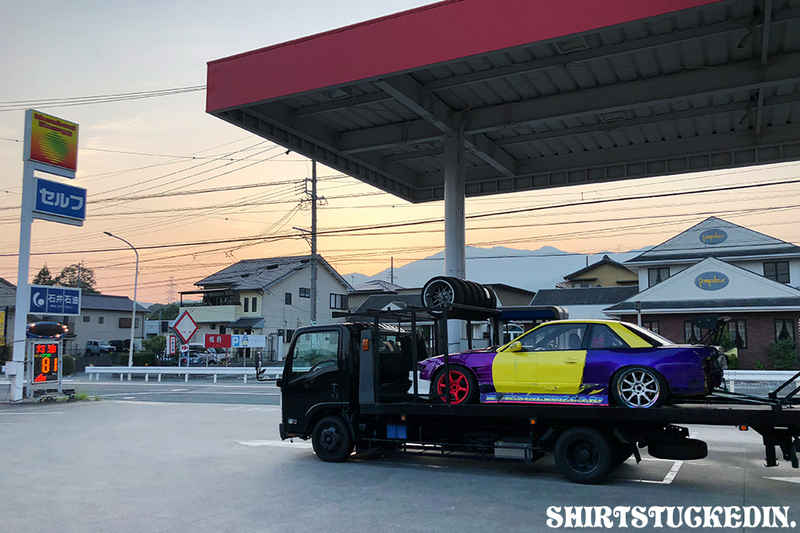 Keisuke bought one of Naoki’s previous street cars which happens to be a S15 with a few very simple and efficient mods. 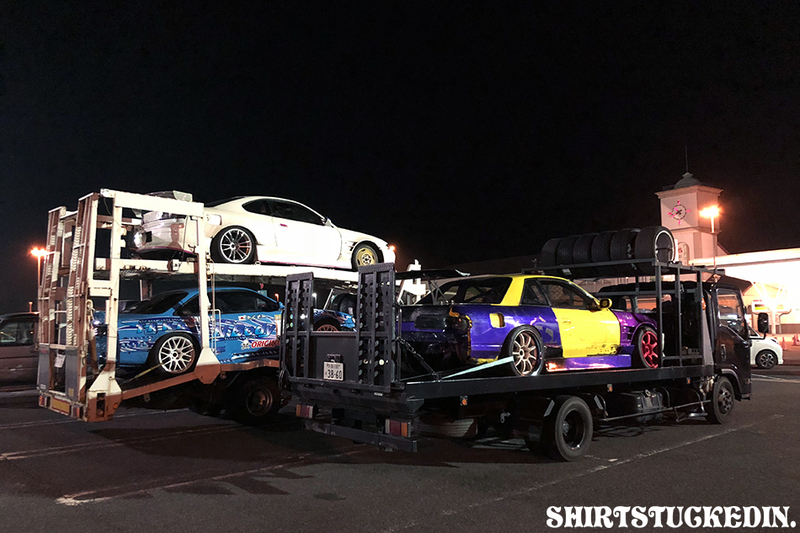 After a solid week both of the cars were somewhat ready to go and we got the word from Takumi Yokota-San who is the owner of the N-Body S14 and newly opened Sky Motors Drift Garage located in Higashi Osaka area that there was a practice day on at Mikawa Motorland held by Garage Dual. Keisuke’s S15 looking pretty under the gas stand lighting. The course is located in Aichi-Ken which is a solid 3-3.5 hours away from Osaka. On this route you pass through many beautiful mountain ranges from Osaka Prefecture into Nara and Mie. Being so far away we both opted for transporters. 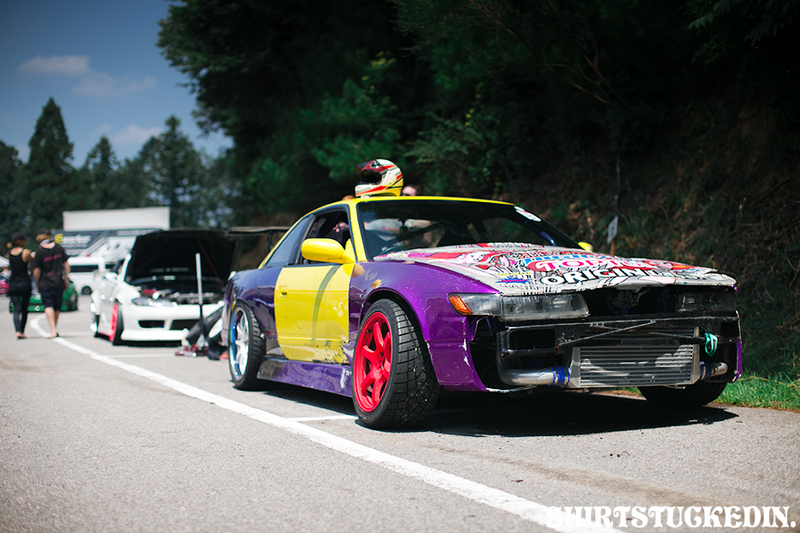 Keisuke’s S15 was riding above Takumi’s S14 in the N-Body truck whilst mine was on a separate truck thanks to Ryota and Imamaeda. 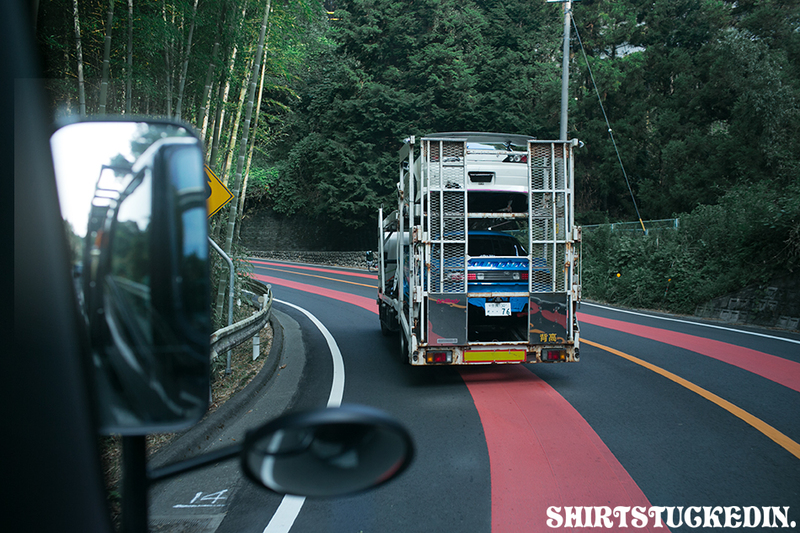 We left early enough to get a few cool shots on the expressway, simple stuff like this always rocks me about Japan. Always plenty to see along the way. …surreal situation for Keisuke and I. 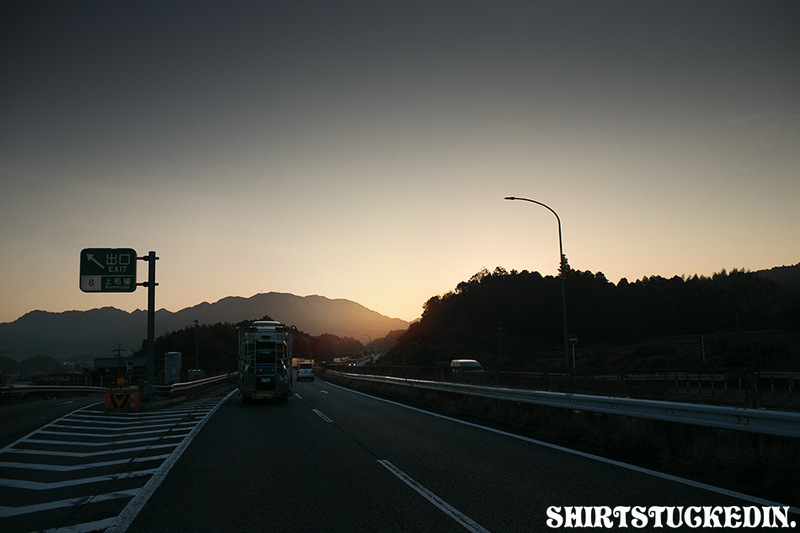 Once off the expressway through Shinshiro you climb a dramatically steep mountain to get to the top where Motorland Mikawa is located. In a way this was and wasn’t the best day to do a shakedown. Middle of summer in Japan or typically before Obon (national holiday) is unbelievably warm and humid. I think the temperature topped out at 41 or 42 degrees celcius however it was a good test to see if the cars would survive or not. With no expectations of how many people would be there driving or spectating we were greeted by many local members such as MCR Factory who are very good friends with the Garage Dual family. Some of these cars setups are getting wild, 255/R18 up front, higher and even more grip all-round. There were a bunch more famous cars and drivers around the pits and on the circuit however I’ll save that for another post down the track. It was a nice feeling having Takumi-san with us on the day who wanted to do some car testing prior to Kansai All Stars which was the following weekend. 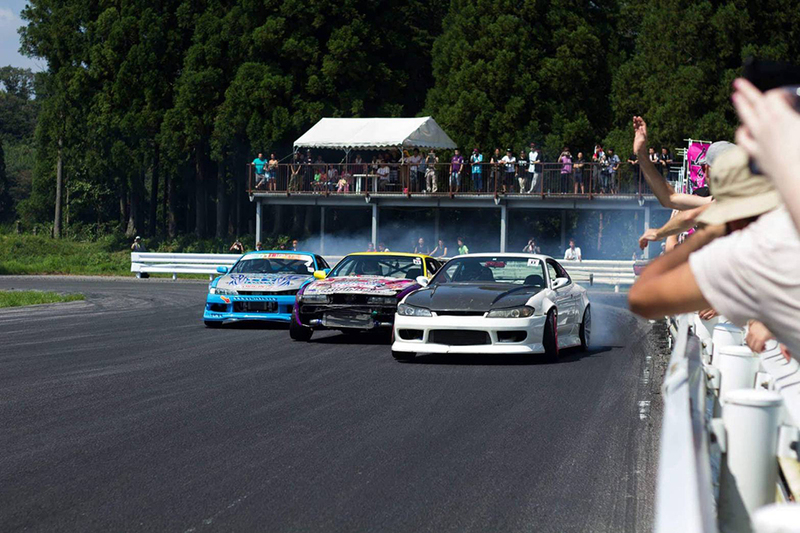 Being a strong competitor in D1 Street Legal / Lights Takumi is an experienced, talented driver and mechanic. 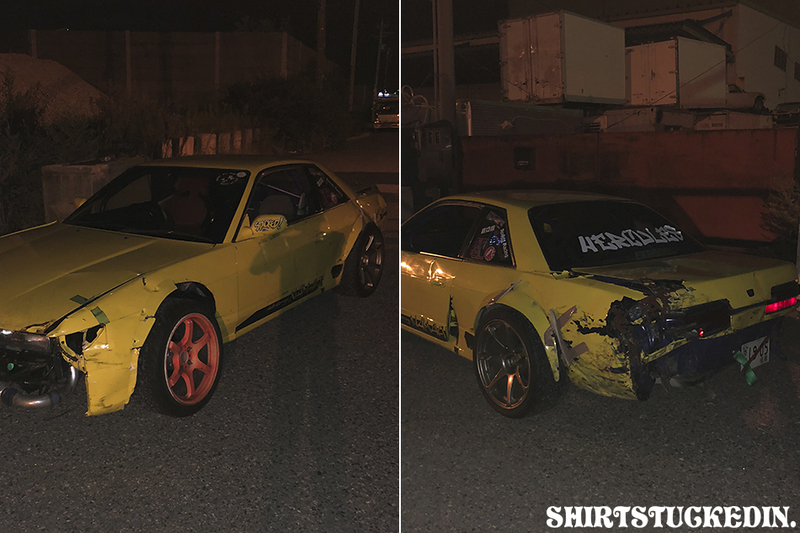 With 12 years of Nissan mechanics under his belt as I previously mentioned above Takumi has now owned his own garage in East Osaka (Yao) to be precise. After a few sessions back to back with Keisuke without any faults this car was probably one of the funnest things I have been behind. 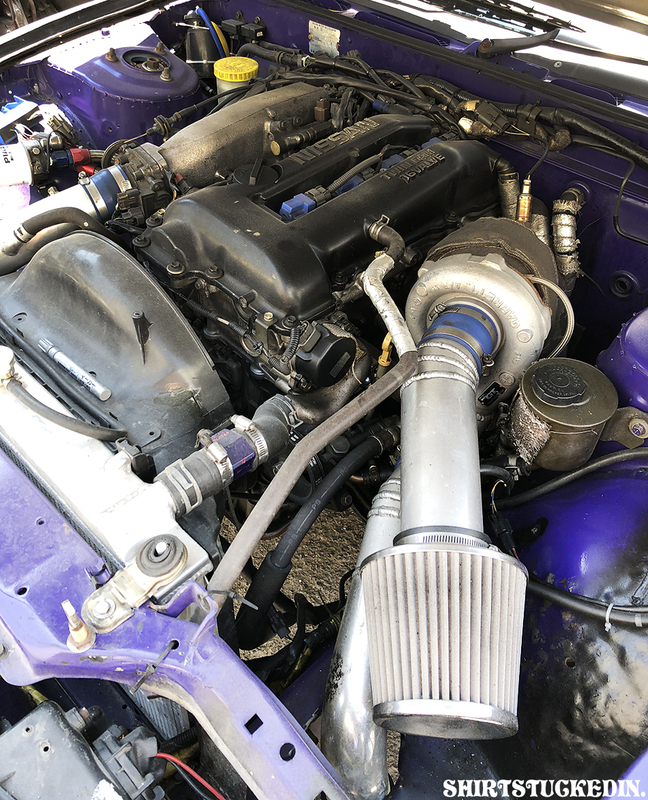 With the car tuned by Neo Style in Wakayama Prefecture it was somewhat making around 350-360HP on around 1 bar of boost. 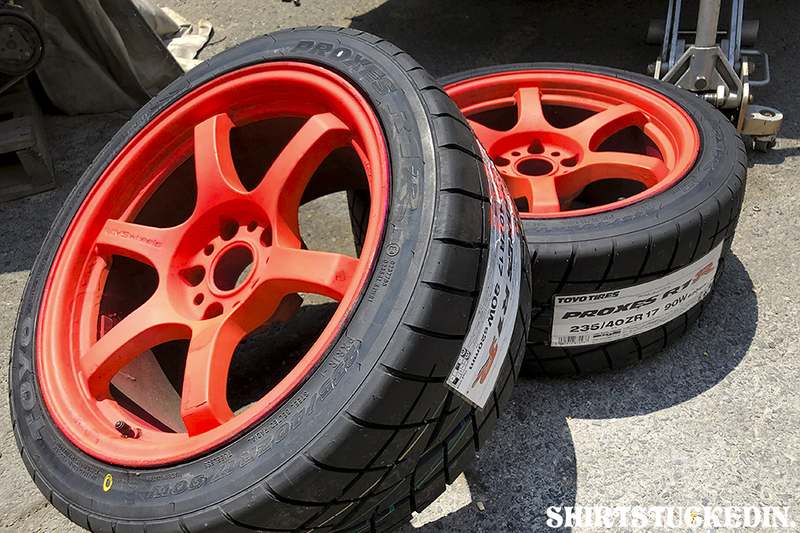 I decided to run radials on the rear – KENDA 265/35/R18 to begin with before jumping into a stickier, grippier tyre just to feel the car out. After a bunch of driving all morning post lunch it was time for an unexpected ドリコン mini-drift-comp in which Takumi mentioned to Keisuke and I if we wanted to be apart of it. Having had 3 members with cars ready to go we happily accepted. 99% of the cars entered. It basically consisted of 3 cars in 3 runs back to back, super simple and fun and a great way to break up the regular classed, practice runs throughout the day. Thankyou for the photo Kurt! Following the mini-drift-comp we had a few more short sessions before calling it a day. With about 45 minutes sleep and temperatures breeching 40 we filled up at the bottom of the mountain and slowly made our way back to Osaka. Moments as such will always be amazing. My original intentions for this trip was to pickup the car and slowly do a few things to it in order to get ready for the end of the year when the weather in Japan would be slightly more enticing to drive. In saying that after this first day of driving Keisuke and I both knew what we wanted to do and were pretty set to maintain the cars and get driving again ASAP. Besides Keisuke’s car getting a little warm after back-to-back runs and my dump pipe wiggling loose it was well and truly a trouble-free day. Here is a little clip following Keisuke and his mid-mounted JAZZ manifold. I also have a little bit of onboard footage from this day which I’ll have to get around to and edit!